(Regarding Tow Brake Systems) I have also heard of some that are somewhat permanent and you never see it. i think that is what i want. Unified by US Gear is seamless once installed. A large device called a solenoid gets mounted under the driver seat, and a vacuum pump is seen under-hood but you don't do anything with them. You only connect one wire harness which handles both the lights and Unified tow brake wiring. When the tow is plugged into the PC, the sytem is awake and ready. There is also a simple break-away cable that you need to connect. You will also need to do the usual towing prep like unlocking your tow steering wheel and putting the transmission in neutral (or whatever your specific tow vehicle requires). 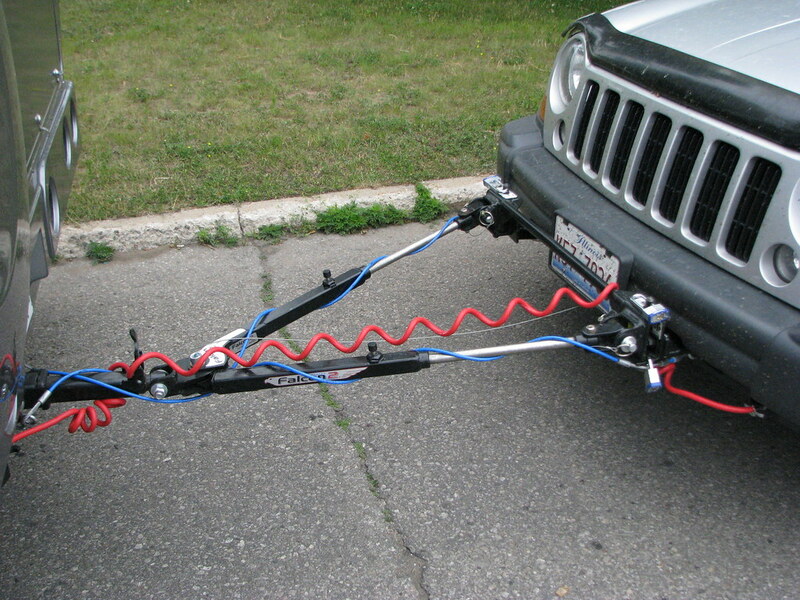 Here is our Jeep Liberty with Roadmaster towing hardware and Unified Tow Brake. The red coily cable has 2 more connections than a standard 4 wire hitch connector. All wires utilize the PC standard hitch connector, Nothing special is required for that. If you look close, you can see a thin raw steel cable. If a failure occurs for any reason and the tow vehicle separates from the PC, that cable pulls a plug which automatically activates the Unified to quickly stop the run-away tow vehicle. The two blue cables are typical safety cables. It sounds like everyone prefers the type of brake that is permanent and hidden rather than the type with the removable unit that sits on the floor of the toad. I am in no hurry to get everything set up yet and we purchased the tow bar, with DW's permission of course so I think we are going the right direction. It has been used very little so I am very happy to have gone and looked at it. The guy had just purchased a rather high dollar MH and was downsized a year later so it was not used but a couple trips. I have gotten way more information here than on another RV site. Thanks to everyone for sharing all your input, knowledge and experience and helping us decide what we should do. We tow a Jeep Wrangler behind our 2551. On our last trip we towed it 2000 miles and then drove it an additional 2000 miles, obviously we use it a lot and would be frustrated not to have it. We do a lot of back road exploring and the Jeep is made for that, we are going to Moab this Fall and planning some spectacular trips into Canyonlands National Park that can only be done with a 4wd high clearance vehicle. I installed the US Gear Unified Brake system 3 years ago and have put 23,000 miles on it, it has worked flawlessly. As others have said, it is invisible once installed, nothing extra to do except attach the breakaway cable. I have had to hit the brakes hard a couple times and it felt like I was dragging an anchor. The system senses how hard you are decelerating and applies the towed vehicle's brakes accordingly. I don't notice the Jeep behind now that I have done some suspension upgrades. Front and rear heavier anti-swaybars and rear trackbar; those, along with alignment, proper tire pressure, and Quiet Hitch clamp make it a pleasure to drive. I think this is the second US Gear brake system mentioned if I remember right. I will do some serious looking at them. I do prefer something seamless like mentioned earlier and that really interests me alot. I don't want any more stuff to do or keep track of than needed and the sound of setting up a brake system every time I break camp just doesn't trip my trigger. Ron, I would never have thought to not tow a car up there. I had plans of parking in a place for a few nights while exploring the NP and the local area. I have heard some horror stories of getting there and how bad the roads are but then I have heard others it is not so bad. I don't know what to believe anymore. My wife was not disappointed you said to not tow as she doesn't even want to drive it. She would rather fly up, rent a car and get a private tour package for a few weeks and then catch a cruise or a rail adventure back to the states to fly back home. Winter in Mexico sounds great to me as I hate snow and cold. I know I live in it and have all my life but doesn't stop me from liking the warmth. Thanks for your input and pictures and information on your set up. We looked pretty close at the Fit but decided we needed a little more room to stow stuff. Thanks for your input. If you think you'd like to tow on a trip to Alaska, don't. Alaska is a trip on the move. You won't be setting up base camp for days at a time which is where a tow vehicle comes in handy. Then there are the ferry charges...by the inch. You'll regret towing up there unless you tow an off road vehicle with plans for true adventure. Ron, I would never have thought to not tow a car up there. I had plans of parking in a place for a few nights while exploring the NP and the local area. I have heard some horror stories of getting there and how bad the roads are but then I have heard others it is not so bad. I don't know what to believe anymore. My wife was not disappointed you said to not tow as she doesn't even want to drive it. She would rather fly up, rent a car and get a private tour package for a few weeks and then catch a cruise or a rail adventure back to the states to fly back home. Alan, I never drove to Alaska, but my brother & wife did 2 years ago and his advise is what I share. We did take a cruise from Vancouver to Whitier, followed by taking an Alaska Railroad trip to Denali NP, with a bus return trip to Anchorage where we got on a plane. The road to Alaska is paved, but road heaves in the permafrost region is rough on vehicles. Much of beautiful Alaska is in the southern fiord region where taking a ferry from one city to another will save 800-1200 miles of mundane driving. The ferry ride is very scenic with sights of snowcapped mountains and sea life including whales. The ferry ride has a bit of cruise ship passenger care with narration of what is seen off the boat and restaurants, etc. In the south is that famous Kodiak bear feading ground viewed from a high boardwalk. Getting on and off the ferry invloves steep angles because of tide variation. If your PC has a little rear-end sag like ours, you might consider installing rear air bags and fill them up to max height just prior to a ferry trip. You can let out the air afterward to soften your ride. Just carry a tiny 12v air compressor for that purpose. Ferries charge by the inch. Cost is very steep, but still cheaper than driving. A tow vehicle could cost hundreds more. Unless you have specific ideas & plans, Alaska is generally a trip where you drive, sight see, and repeat that over and over. 10,000 miles of that. You sleep wherever you happen to be at that moment, then move on the next day. You will be dragging a tow vehicle for most of the trip but never unhook it. The few times you might want it, consider a rental. But given you own a 2400, it's small enough to get around in with little hassle. About Denali NP, a tow vehicle won't help you there either because private vehicles are prohibited in the park unless a passenger is handicapped. They have great bus service for that which is quite nice. The driver is very good about explaining a lot of things and stopping for wildlife and scenery. It is quite the experience.....I am speaking from 2008 personal experience on this one. The road to Alaska is paved, but road heaves in the perafrost region is rough on vehicles. Unless you have specific ideas, Alaska is generally a trip where you drive, sight see, and repeat that over and over. 10,000 miles of that. You sleep wherever you happen to be at that moment, then move on the next day. You will be dragging a tow vehicle for most of the trip but never unhook it. The few times you might want it, I would inquire about a rental. But given you own a 2400, it's small enough to get around in like a regular car. About Denali NP, a tow vehicle won't help you there either because private vehicles are prohibited in the park. They have bus service for that which is quite nice. The driver is very good explaining things and stopping for wildlife and scenery. It is quite the experience.....speaking from 2008 personal experience on this one. Well now that is not what I expected. Maybe the other half has the better idea here. I am all about the adventure and the journey. The destination is just the cherry on top! I think we will leave Alaska to be done with a plane fare, rental car, ferry, rail service and on foot where needed. Thanks for the heads up. Well my response above this just didn't come out right at all! Anyway, I agree with what you say about more things to worry about. I don't want to create more things to do but make my journey better and more fun. My 2400 gets around very well without towing a car, which is where I was getting all the push back from DW. We have been all over the US with it as it is but as someone else mentioned earlier about the hassle of sightseeing in it, finding a place to park, is it level, going for lunch/dinner, getting into tight places or going on walking tours where we have to leave it on a level place is a real pita. Wife doesn't want to tow as she doesn't see the problem. I never get to see anything where I am constantly looking for clearance, width and cannot move around inside much to see the sights while I am driving. Not whining (not too much anyway!) I hope the CR V pulls pretty good.. I would just say make sure the tow bar is within 3" of being level between the Ford and the Honda, you do not want the Honda riding up or going under the chassis (alot of leverage on that tow bar that can act as a lever and push hard). Oh yes, it is very important that the tow bar be as level as you can get it. The steeper the angle the worse the bucking. I call it the steam locomotive effect between the steam piston and the drive wheel. With that bar uneven, when the motor home or the tow vehicle hits a bump, the bar pushes & pulls with a quick jerk creating that bucking effect. With the bar level, there is none. It is a matter of physics. Our Jeep Liberty shown in that 1st picture is "BAD" because the bar is at a significant angle, low to the motor home, up to the tow vehicle. I have since bought a riser but have yet to try it out. This picture shows the angle of which we had some serious bucking. The Quiet Hitch hardware helped immensely, but masks the real problem. We live in Alaska and have driven the Alaska Highway four times so far in our PC. Lots of people travel up here towing a toad, but I would never recommend it to anyone because of the condition of the roads particularly in the Yukon. 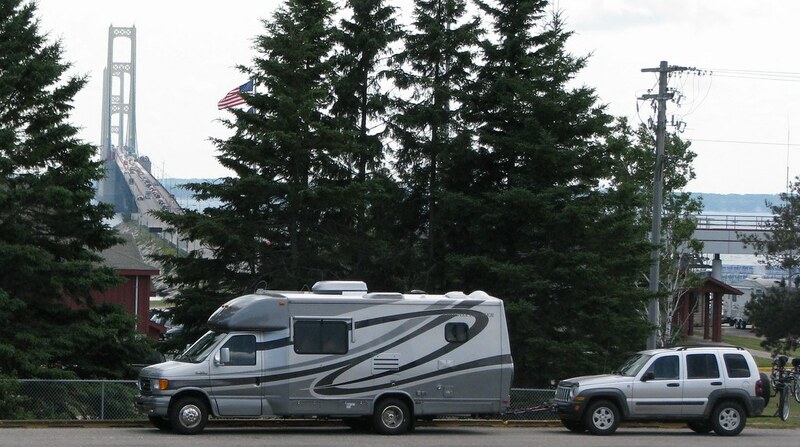 There are tons of RV's in Alaska and most places readily accommodate all but the biggest. Our PC is a 2400 and we have chosen not to tow so far, we rent a car when we are visiting cities like Chicago, Boston, or Pittsburgh. I think I am not going to travel to Alaska in the MH. It sounds so great but I just don't think I want to tear my MH up. Looks like it will be an airline trip. I see you have a 2400 also. We love ours and just can't find anything any better. The only issue we have is the sofa bed and it isn't an issue for me but for her. Her height makes one of the crossbars in the couch hits her in the back whereas I don't even feel it. We solved that problem with a queen size 4" thick memory foam mattress topper but it is a hassle putting it on each night and putting it away each morning. Sleep like a baby now. It is so handy that is why my wife questions my sanity in getting a toad. She may be right but I still want something smaller to sightsee in. I have been making small improvements to it here and there and I am down to the last few things so I may just keep it for a few more years. I want to replace my chair with a recliner and have some customizing done on the couch and then I think I am done! Well, new tires and a line up and then I am done. I use the RVi brake system which is one you describe as one "that sits on the floor". I have used it with two class A's and now my PC. I find that it's an outstanding system and is readily exchangeable with different toads and RVs. We have two toads that we tow four down and it's a simple job to switch the brake system between them. I understand that their latest unit has a tire sensor system built-in. I would highly recommend them for a brake system. Our favorite toad with the PC is our small Ford Ranger pick-up truck with a covered bed. Storage is tight after stepping down from a class A. Towing the 3100# Ranger allows us to carry some of the goodies that we enjoy on trips, but could not carry otherwise. We have the freedom to explore or just go out to eat. I doubt that it costs a mile per gallon, but we wouldn't be without it. Thanks for your input and we condidered the Ranger to begn with but could not find one that hadn't been beat. I think we will be the same way soon when ever DW discovers the convenience of having small wheel along. She grew up very close to MO so i have to show her on occasion. Donw side is I grew up about two miles from where she did so I have to have someone show me also! LOL!! Thanks for your input. i appreciate it.